Now that broadband internet has become better at handling larger uploads, online backup solutions have become a much more viable way to keep your most important files and documents safe. They don't require extra hardware, like external hard drives, and the files are kept in a remote location that will keep them safe if something happens to your PC – or even your home. 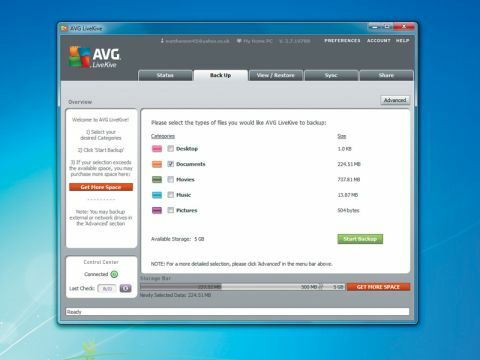 A lot of online backup utilities offer a free version with limited space, with the option to purchase more space. This marketing model relies on users signing up for free, then being so impressed that they subscribe to get more space and extra features. Dropbox is one of the most popular online backup solutions, mainly because of its simplicity – you can back up and sync files by dragging and dropping them into the Dropbox folder. Now AVG, best known for its free antivirus software, has entered the ring with its own solution: Live Kive. Although reasonably easy to use, it's still a long way from Dropbox's intuitive interface. From the main page you can select how often you want to back up, when folders and their contents should be synchronised, and when designated files and folders are shared between your devices. Tabs along the top let you delve deeper into the settings, like which files and folders you want to save online. You can choose the save folders by category – like 'Music' or 'Documents' – or click 'Advanced' to select files or folders. Live Kive lacks the simplicity of Dropbox, but its comprehensive interface means you can tweak settings to create a backup plan that suits you perfectly. The interface also does a good job of being as straightforward, or as in-depth as you need. The free version gives you 5GB of storage space, while the paid-for versions give you 25GB or unlimited space. AVG Live Kive is a strong contender that's still in its early stages. The free version is well worth trying out, and with AVG behind it we're sure it will go from strength to strength.